We are developing laser ultrasonic and ultrasonic imaging methods in collaboration with several industry partners. Applications range from ultrasonic quality control in food or steel to laser ultrasonic tomography. For more information, please contact: Ari Salmi. Laser-ultrasonics provides a non-contact method for delivering agency in tissue and measuring room acoustics. Ultrasound is generated with a pulsed laser and detected with an interferometer. We are developing several different techniques employing laser-ultrasonics. Couple of example cases are presented below. Illustration of the surface wave dispersion method principle for coating thickness estimation. Higher frequencies propagate mainly in the coating and are less affected by the bulk properties of the material. Thin zirconium oxide layer thickness estimation from Rayleigh wave dispersion curves. Theoretical dispersion curves for different oxide layer thickness (left). An automated fit for a measured curve gives an estimate of the layer thickness (6.5±0.3µm) (right). Laser ultrasonic point-by-point B-scan of a layered polymer structure. Image shows both two layers and the wedge shaped structure of the lower layer. Laser sparks can be used as a point-like, broadband and massless sound source. The source can be arbitrarily positioned and enables versatile applications. At the electronics research laboratory we perform laser ultrasound tomography. Here, a high power pulsed Nd:YAG ( laser excites propagating surface waves on the sample. A laser Doppler vibrometer (LDV) reads the amplitude of the propagating waves. We scan the sample by rotating it and performing measurements point by point. 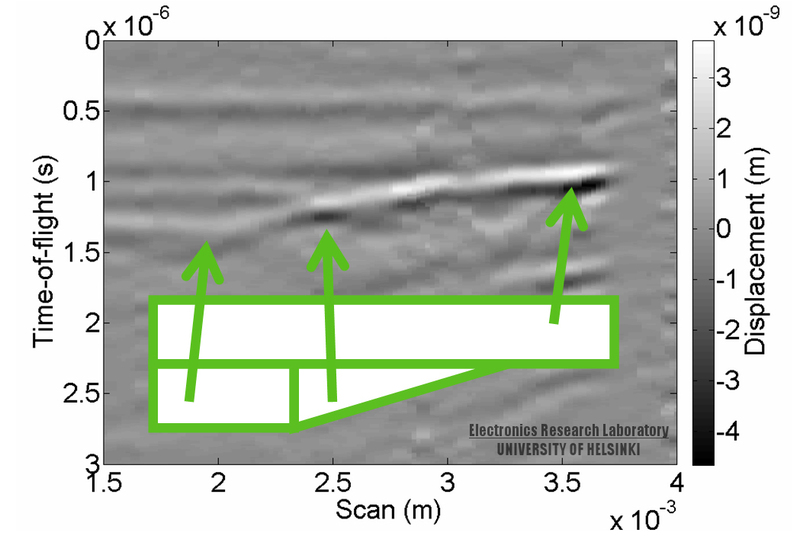 The result is a two-dimensional map where one can identify imperfections in the sample such as voids, holes and cracks. In the figure below, we show laser ultrasound measurements on a steel hemisphere that is 50 mm in diameter (left). Here an Nd:YAG excites surface waves at the center of the sample while a LDV measures their amplitude at the brim of the hemisphere. A defect 14.5 mm in size located at 208 degrees is clearly visible in the resulting map (right) of the propagating surface waves. We have an Calmar femtosecond laser (FLCPA-05UUHF, 1030/515 nm, 370 fs) which we use for pump-probe experimentation. 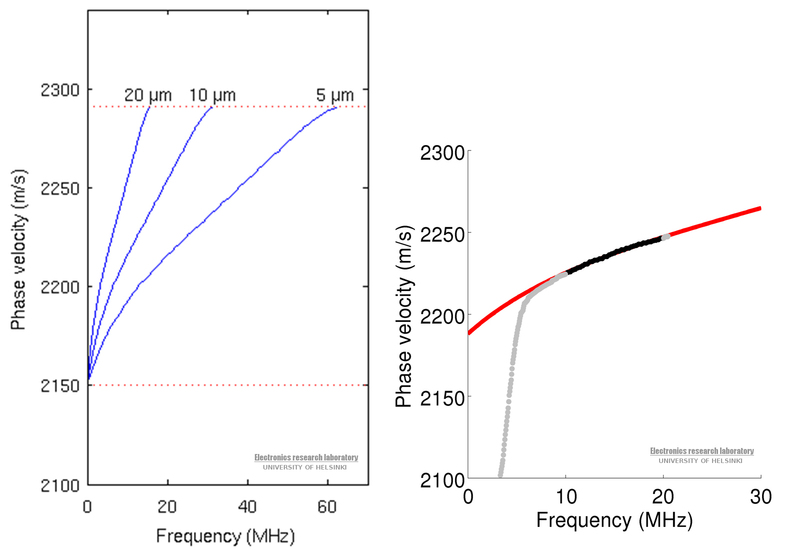 We are developing nanoacoustic experiments, specifically through-transmission and pulse-echo experimentation on micro- and nanoscale samples.